I was just 19, in Romania for my first time. A new friend took me inside his home, to the hearth, and introduced me to what was left of his great-grandfather. It was a skull — and as was the tradition apparently there in the mountains of Transylvania — families remembered long dead loved ones with this honored spot above the fireplace. I remember feeling a little bone envy. 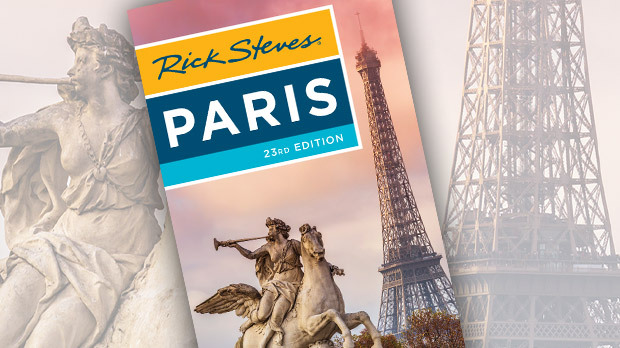 Later, on that same trip, I was deep under the streets of Paris, all alone…surrounded by literally millions of human bones — tibiae, fibiae, pelvises, and skulls — stacked along miles of catacombs. I picked up a skull. As two centuries of dust tumbled off it, I looked at it…Hamlet-style. Just holding it was a thrill. I tried to get comfortable with it…in a way…to get to know it. I struggled to stick it into my daybag. No one would ever know. The head dated back to Napoleonic times. What an incredible souvenir. But I just couldn’t do it. The next year, I went back to the same place, pumped up…determined to steal me a skull. It was a different scene. Skulls within easy reach of visitors were now wired together. And signs warned that bags would be checked at the exit. While I eventually outgrew my desire to steal a skull, in later years, as a tour guide, I’ve noticed how intrigued many tourists (of any age) are with bones. 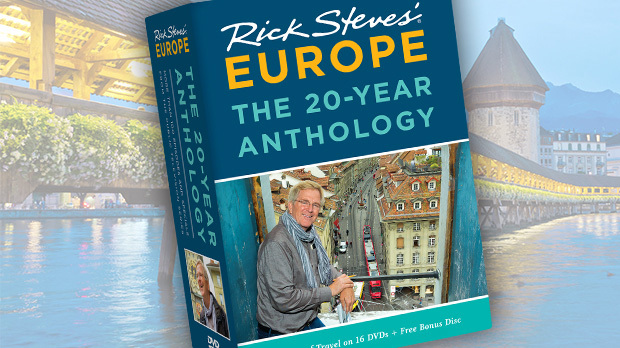 If bones are on your list, Europe won’t let you down. Europe’s ultimate display of bones is the Paris Catacombs, showing off the anonymous bones of six million permanent Parisians. In 1786, the government of Paris decided to relieve congestion and improve sanitary conditions by emptying the city cemeteries (which traditionally surrounded churches) into an official ossuary. The perfect locale was its many miles of underground tunnels from limestone quarries. For decades, the priests of Paris led ceremonial processions of black-veiled, bone-laden carts into the quarries, where the bones were stacked into piles five feet high and as much as 80 feet deep behind neat walls of skull-studded tibiae. Each transfer was completed with the placement of a plaque indicating the church and district from which that stack of bones came and the date they arrived. Visitors descend a long a spiral staircase into this boned underworld. You start the one-mile subterranean walk by ignoring the sign that announces: “Halt, this is the empire of the dead.” Along the way, plaques encourage visitors to reflect upon their destiny: “Happy is he who is forever faced with the hour of his death and prepares himself for the end every day.” You emerge far from where you entered, with white-limestone-covered toes, letting anyone in the know you’ve been underground gawking at bones. If you know where to look, you can find fascinating bones throughout Europe. 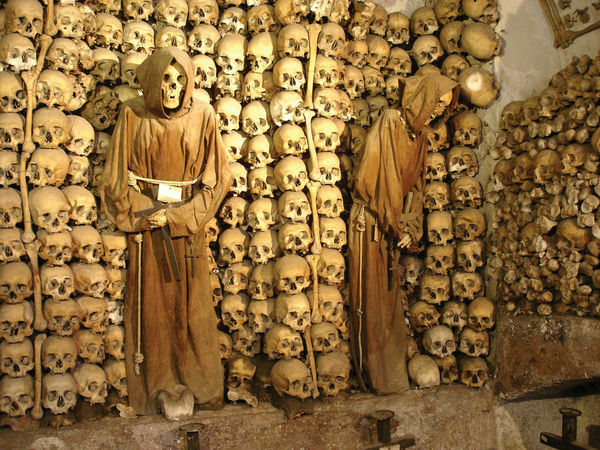 Capuchin monks have a habit of hanging their dead brothers up to dry and then opening their skeleton-filled crypts up to the public. Their mission: to remind you (mid-vacation) that in a relatively short period of time, you’ll be in the same state…so give some thought to your mortality and how you might be spending eternity. 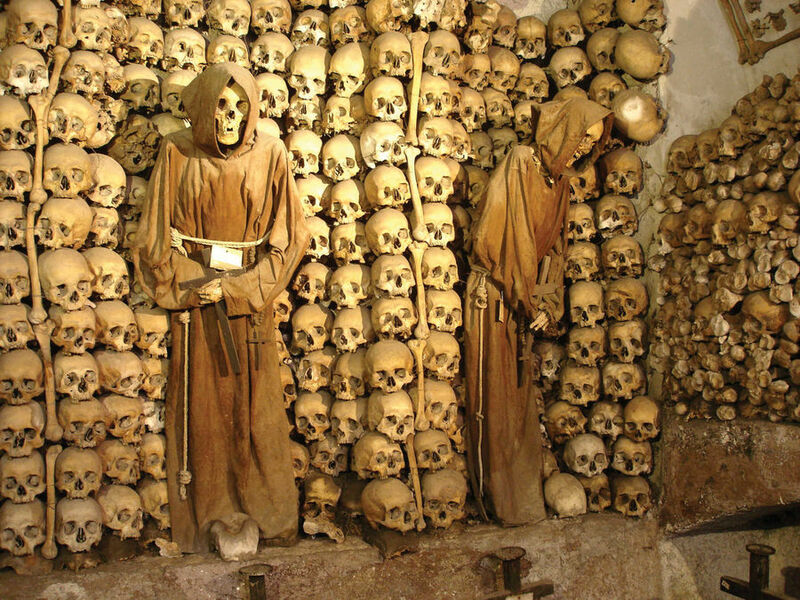 In the Capuchin Crypt in Rome, the bones of 4,000 monks who died between 1528 and 1870 are lined up for the delight — or disgust — of the always-wide-eyed visitor. A plaque explains the monastic message: “We were what you are…you will become what we are now.” Osteophiles make a pilgrimage to similarly macabre houses of bones at churches in Palermo (Sicily) and in Évora (Portugal). Austria’s tiny town of Hallstatt is bullied onto a thin strip of land between a swan-ruled lake and a steep mountain. Space is so limited in Hallstatt, bones get only 12 peaceful buried years in the church cemetery before making way for the newly dead. The result is a fascinating chapel of bones in the cemetery. Each skull is lovingly named, dated, and decorated, with the men getting ivy, and the women, roses. Hallstatt stopped this practice in the 1960s, about the same time the Catholic Church began permitting cremation. In the Czech Republic, Kutná Hora’s ossuary is decorated with the bones of 40,000 people, many of them plague victims. The monks who stacked these bones 400 years ago wanted viewers to remember that the earthly church is a community of both the living and the dead. Later bone-stackers were more into design than theology — creating, for instance, a chandelier made with every bone in the human body.